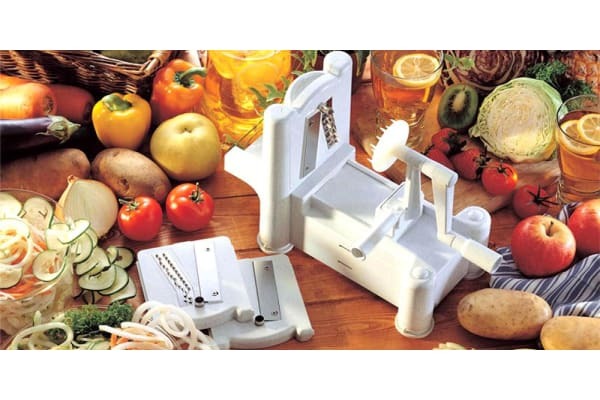 This vegetable slicer creates spiral cuts and vegetable or fruit noodles in seconds. The frame and blade plates are constructed of very high-quality, impact-resistant ABS plastic that is BPA-free, and the blades are made of stainless steel. It has four powerful suction feet that are fitted with tabs for easy release, and does not require an outlet connection or batteries. 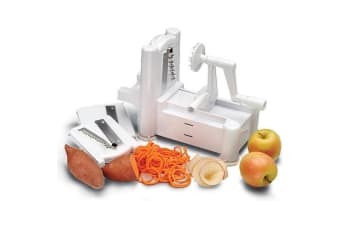 The slicer is an easy-to-use, handy tool that makes zucchini spaghetti, cucumber ribbon strands, curly fries or long, spiral apple strands. It comes with three blades: a shredder blade (small holes), a chipper blade (large holes) and a straight blade. A storage compartment beneath the frame stores two blades and the third blade comes already in place. Includes 3 sets of blades: 1/8-inch spacing, 1/4-inch spacing, and straight blade for ribbon cuts.